There are crowds everywhere for Mexico’s Independence Day. I knew that it was sheer folly to assemble family members in one place and try to please them all. There would be the star attractions, in-laws (or outlaws, as they are known within the family), adult children, teens and various family wannabees, all with their food preferences and aptitude, or not, for playing well with others. How on earth could I get everyone in one place at one time? Should I get a bigger whip to crack? In the end it was easy. We (the star attractions) announced that we’d arrive in Oxnard on specific dates and, miraculously, the attendees descended from various cities during that timeframe, arranging their own schedules. Announce it, and they will come, so they say. Serving our needs was a spacious beach house, complete with hot tub, sun deck, bar-b-que and plenty of sleeping space, just half a block away from an immense stretch of sand and adjacent to a well-used park. Although we were but a three-hour drive away from San Clemente, we felt we were in a different world where our family circus could proceed unhindered, a motley clutch of clowns falling over each other. While the memories flowed, so did the wine, and when tongues were loosened, so were belts and buttons. Predictably, this is where the juggling act started. Rather than insist on everyone taking a side-trip together, small groups set off to explore their particular area of interest. Did I hear a ripple of applause from the audience? Not everyone wanted to go shopping at the outlet center in nearby Camarillo, and not everyone wanted to go and look at flower fields in Lompoc, but there was a significant interest in a hike to the Seal Preserve in Carpinteria. Just a short trip North on Highway 101, exiting directly into the free car park, we had easy access onto the trail. Adding to the thrill, an Amtrak train gave us a cheery whistle as we walked beneath the fragrant eucalyptus trees alongside the track, until we reached the bluffs and a spectacular view of the ocean. Other hikers remarked on the pungent odor of a rotting carcass lying on the beach, soberly validated by the languid perch of several turkey buzzards, too full to fly. This balance of nature led us to the observation point where Seal Watch volunteers were happy to spark our interest and point out what was happening in the protected beach below. 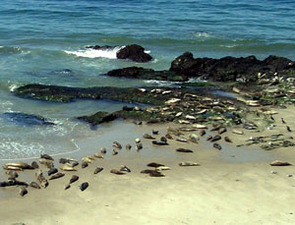 On this day, nothing was happening, just basking seals - although a couple did get up for a frolic in the surf. Hmm, just another day in the Sanctuary Spa. ussion on the environment and leaving big, fat, hairy carbon footprints on the planet. Once everyone got back in their emotional cages, courtesy of the lion tamer, plans began for the teens to visit the Channel Islands National Park, as they were eager to learn more about the endangered Channel Island Foxes (see box). A day trip by boat ($45 www.islandpackers.com) was easily arranged and they came back with sophisticated information on the abundant marine life, rising seas and shrinking islands, and about the unique plants and animals found 11 miles off the coast in the “Galapagos Islands of North America”. California’s Strawberry Coast lives up to its name sporting large agricultural areas, and it was a pleasure to drive past the roadside stands laden with fresh fruits, flowers and veggies. Driving inland on our next excursion we could see fields of avocados, citrus fruits and miles of vineyards occasionally interrupted with unexpected splotches of color from pink Stocks and arrogant blue Delphiniums. The wineries incited an enthusiasm and I could see we’d lose a few of the group to a high-flying giggling act. We did, but this vacation wasn’t about walking the tightrope – everyone got to do something they enjoyed, and relaxed. Surprisingly, we were able to keep the plates spinning in the air as we set off for historic Fillmore and the railroad depot. The Fillmore and Western Railway (www.fwry.com) runs a fully operational antique 1920s style Pullman, restored with dining cars, sleepers and baggage cars. 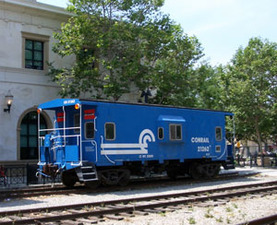 Every Saturday there is a three-hour scenic trip ($22) to Santa Paula, allowing time to explore the unique shops, wine-tasting options and Victorian-style houses in a quaint turn-of-the-century ambiance. Even the engineer and ticket-taker dress in vintage railroad costumes and everyone waits to hear the crowd-pleaser, “All Aboard” from the conductor.